We provide a one-stop service for ordering bespoke accessories for your wedding. 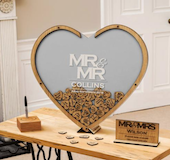 From Save-the-Dates to Sign-Your-Name frame guestbooks and jigsaws, postboxes, table names, place names and signs. We also make a variety of gifts for the wedding party. At Stag Design we take great pride in our work. We are a small team which designs and makes high quality products with great care and attention. We believe that our customers deserve the best service and we do all that we can to deliver this.